Since 1980, Day Runner ® has been at the top of the organizational chain keeping you organized in style with their Day Runner planners and calendars, Day Runner refills and high quality organizational products. Day Runner refills - Whether you have a Day Runner planner or other organizer brand, plan to buy some Day Runner refills to keep your day in order. Choose from dated or undated refills. With a Day Runner planner refill you'll not only want to pick up your own Day Runner Day planner to match, but month after month, year after year, you'll keep coming back for more. 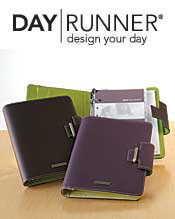 Day planners - Depend on a planner and Day Runner refills to keep you organized and on schedule. For detailed or simple planning, find a smart leather planner featuring either refillable or non-refillable designs. Let Day Runner help your day run smoothly with grace and elegance. Weekly and Monthly planners - Make it a week or month to remember with weekly and monthly planners from Day Runner®, one of the most trusted name brands. Merging style with function, you'll find planners and planner refills that offer the casual style you want with all of the professional scheduling power you need! Family Matters® products - Featuring various products focused on keeping your family organized with ingenious color-coding, find info boards, planners, calendars and other brilliant products that will keep things simple. If your family's events are hard to keep track of, Family Matters® can help. They were even recently featured on NBC's Today Show! Day Runner calendars - Make it a great calendar year with plenty of wall calendars and calendar day planner refills to choose from, or get a head start and stock up for next year with a 2012 Dar Runner Calendar or 2012 Day Runner planner refill! You'll find wall calendars, desk calendars plus handy organizational boards to keep track of even the busiest family schedules. Personal journals - Dear Diary, I've never had a nicer journal than this one I found at Day Runner! Whether you're shopping for a personal journal, professional journal or diary, choose from an impressive collection of casebound, wirebound, die-cut, faux leather journals, desk journals and more! Plus find fine stationery and correspondence kits, notepads, and other organizational paper products. Address books - You're always losing email addresses, and keeping track of home addresses for your annual Christmas card list is nearly impossible. Find a dependable assortment of address books from zip-close to mini pocket, plain or trendy designs featuring the loveliest artwork. And if you fill up your little black book, count on Day Runner to always have a refill! Whether your goal is to be more organized or communicate with ease with design, style and fashion, Day Runner has the highest quality day planners and calendar refills designed to meet your home or office needs.